As you know, for us it has always been about making genealogy easier for everyone and helping people understand how important it is. We think this is a game changer that will really help. 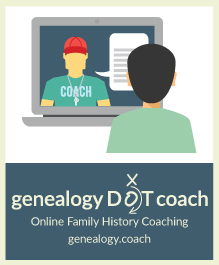 Introducing GenealogyDOTcoach. "Clients leave the coaching sessions with a game plan for how to move forward in their family history research," says Hovorka. "Just like life coaches or athletic coaches, genealogy coaches can give you the boost you need to be better at what you enjoy."